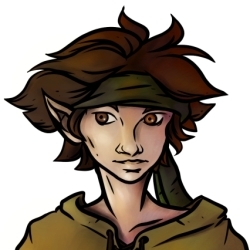 Tamet (tA-met), was born thirteen years ago, among the Elven brats of the Kirkwall Alienage. His parents weren't very known outside the Alienage, his father was a laborer and his mother occasionally worked as a serving girl at the Hangman. What people didn't know, was about their involvement with the Mage's Collective. Although they were not mages themselves, they had a very strong opinion of how Mages were being treated in the Gallows long before the troubles started happening. However, when Tamet was five, they were killed in a raid by Templars who were tipped off about on-going blood magic. He was taken in by his Aunt, Tianna, who tried to raise the boy of her mage-loving sister. For the most part they didn't get along, though, they were still family. For the next several years, Tamet began getting involved in the wrong sort of business, he began to steal, and pick fights. When confronted about these things, he'd lie, or make something up. Eventually it got to the point where he began picking fights with upper-class humans. One in particular, who took his ear, and dubbed him 'half-knife', when he was nine. This drove Tamet to revenge, and has spent the last three years trying to find this noble boy. In that time, he's joined up with a gang of street urchins called the Silent Heralds, when he was 11, and has narrowed down the location of his prey to Hightown. He's recently been dubbed a runner for his gang, and has been seen all throughout Kirkwall, stealing, sneaking, and watching. He seeks information, and access to places an Alienage Brat might not have access too, or other thrills that he might dip his grubby little fingers into. He's a thief, skulk, and information broker.